West Africa is currently experiencing the largest outbreak of Ebola virus disease (EVD) in history. Lyon, G. M., A. K. Mehta, J. B. Varkey, K. Brantly, L. Plyler, A. K. McElroy, C. S. Kraft, J. S. Towner, C. Spiropoulou, U. Stroher, T. M. Uyeki, B. S. Ribner and U. Emory Serious Communicable Diseases (2014). 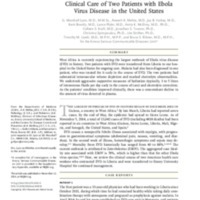 "Clinical care of two patients with Ebola virus disease in the United States." N Engl J Med 371(25): 2402-2409. West Africa is currently experiencing the largest outbreak of Ebola virus disease (EVD) in history. Two patients with EVD were transferred from Liberia to our hospital in the United States for ongoing care. Malaria had also been diagnosed in one patient, who was treated for it early in the course of EVD. The two patients had substantial intravascular volume depletion and marked electrolyte abnormalities. We undertook aggressive supportive measures of hydration (typically, 3 to 5 liters of intravenous fluids per day early in the course of care) and electrolyte correction. As the patients' condition improved clinically, there was a concomitant decline in the amount of virus detected in plasma. Lyon, G. M., A. K. Mehta, J. B. Varkey, K. Brantly, L. Plyler, A. K. McElroy, C. S. Kraft, J. S. Towner, C. Spiropoulou, U. Stroher, T. M. Uyeki, B. S. Ribner and U. Emory Serious Communicable Diseases, “Clinical care of two patients with Ebola virus disease in the United States,” NETEC Repository, accessed April 22, 2019, https://repository.netecweb.org/items/show/156.